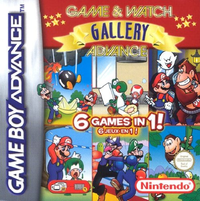 Game & Watch Gallery Advance, also known as Game & Watch Gallery 4 in North America, is the fourth game in the Game & Watch Gallery series of compilations featuring remakes and ports of Game & Watch games. With a total of twenty playable games, this title has more games than any of the previous games. The game was planned to be released in Japan, but was cancelled for unknown reasons. This page was last edited on 13 September 2013, at 01:11.